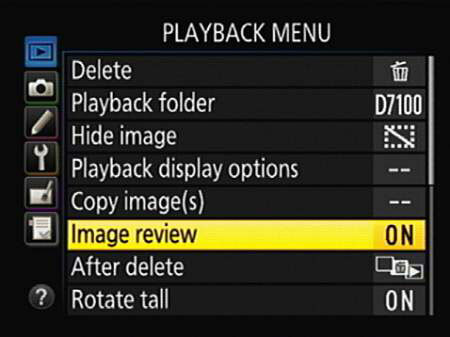 To switch your Nikon D7100 camera to playback mode, just press the Playback button. Then press the Multi Selector right or left to scroll through your pictures. Adjust the timing of automatic playback shutoff. After you press the Playback button, the monitor turns off automatically if 10 seconds elapse without any activity. You can adjust this shutoff timing through the Monitor Off Delay option, found in the Timers/AE Lock section of the Custom Setting menu and shown on the left. Choose Playback, as shown on the right, to access the timing options, which range from 4 seconds to 10 minutes. (This setting affects still photos only; movies play in their entirety unless you pause or stop playback.) Remember that the monitor is a big battery drain, so keep the display time as short as you find practical. Enable instant review. You can tell the camera to display each photo for a quick review immediately after you shoot it. This feature is disabled by default; enable it through the Image Review option on the Playback menu. Again, this option has no effect when you’re shooting movies; to view a movie, you must set the camera to playback mode and then press the OK button. Adjust the length of the instant-review period. By default, the instant-review period lasts 4 seconds, but you can adjust this timing through the Monitor Off Delay option shown. Just choose Image Review instead of Playback when you get to the right screen in the figure. Settings range from 2 seconds to 10 minutes. When you take a picture, the camera can record the image orientation — whether you held the camera normally, creating a horizontally oriented image, or turned the camera on its side to shoot a vertically oriented photo. This orientation data is added to the picture metadata, which is hidden data that records various camera settings. During playback, the camera can read the orientation data and automatically rotate the image so that it appears in the upright position, as shown on the left. Or you can disable rotation, in which case vertically oriented pictures appear sideways, as shown on the right. Auto Image Rotation: This option, on the Setup menu, determines whether the orientation data is included in the picture file. The default setting is On; select Off to leave out the data. Note that if you do include the rotation data, the picture is also automatically rotated when you view it in Nikon ViewNX 2, the free software that ships with your camera, and in other photo programs that can read the data. Rotate Tall: Found on the Playback menu, this option controls whether the camera pays attention to the orientation data. The default setting is On, and vertical pictures are rotated during playback. Regardless of these settings, movies aren’t rotated, nor are still photos rotated during the instant-review period. Also, be aware that shooting with the lens pointing directly up or down sometimes confuses the camera, causing it to record the wrong orientation data in the file.